Please note: Due to building work the Imperial Hall will not be available for events from the end of June to Mid-September 2019. 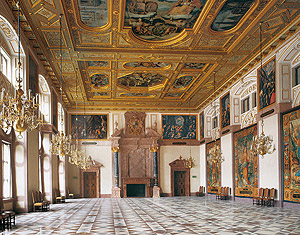 Please note: The Imperial Hall and the Four White Horses Hall are generally reserved for use by the government of Bavaria and can be booked for private functions only in exceptional cases. Please note that when a catering firm is engaged, it has to pay 13% of the catering charges to the Residence.